The FF hits 100kph in 3.7 seconds with a top speed of more than 322kph. (Bloomberg) Ferrari keeps its secrets better than a Cold War spy agency. 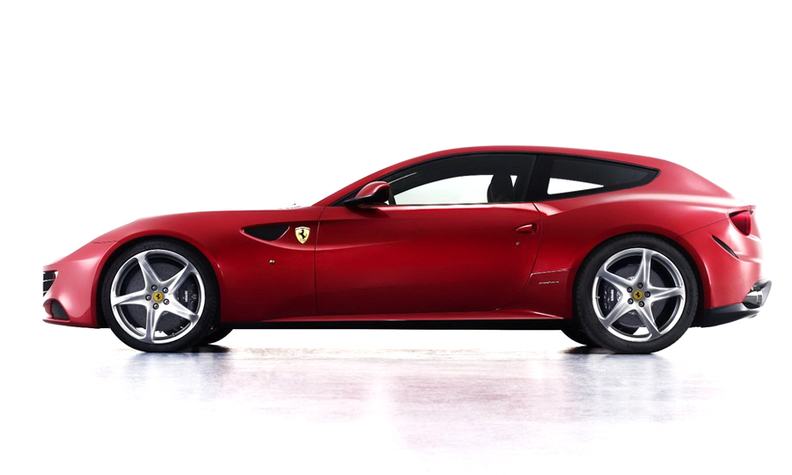 No one saw the radically shaped, four-seat Ferrari FF coming. It broke cover in late January, along with the news that it would be the company's first-ever four-wheel-drive model. Two months later, I'm tucked behind the wheel of the $300,000 FF, testing its V-12-powered moves deep in the Dolomite mountains of northern Italy. Talk about a happy turn of events. My Ferrari is tackling a series of thickly stacked switchbacks, white snow spilling onto the asphalt on both sides. A skier on a slope alongside the road fixates on the car and wipes out. I know how he feels, breathing shallowly as I steer around an uphill hairpin and hammer the gas, engaging the fwd. A risky move in an expensive car that isn't yours. There's only a slight chirp of tires as I drift around the wickedly sharp turn. Then I'm through and tearing up the hill at about 100kph. The FF is deceptively civil -- except for the banshee howl of the front-mounted 651-hp motor that could cause avalanches. South Tyrol's vast landscape offers snow-covered crags and DayGlo-green valley grasses. Dry and wet, cold and sunny -- ideal for testing a fwd system. While Lamborghini uses all-wheel drive on all its cars, Ferrari has always maintained that rear-wheel drive is performance king. Perhaps that's why it insists this system is meant only for inclement weather, as if the FF were a snow plow with especially nice leather bucket seats. Either way, in addition to the denizens of Aspen and St. Moritz, it will also appeal in emerging markets like China, Russia and India, since it accommodates four adults and is robust enough to handle all types of roads. The funky shape is what insiders call a "shooting brake," essentially a long nose mated to a two-door cockpit and hatchback. Some say it's a far cry from what a Ferrari should be, but I like the design gumption. It's officially the replacement for the less-than-adored four-seat 612 Scaglietti, but over pre-dinner drinks, Ferrari Chairman Luca di Montezemolo told me: "It's revolution, not evolution. We started with a blank sheet of paper. To me it's an emotional car." The FF looks oversize in photos, but the shotgun wedding of four seats and aggressive sports styling is more organic in real life. The gaping black front grille is as fearsome as the mouth of a Great White shark. It seems ready to snack on lesser vehicles unfortunate enough to be caught in the asphalt current. Though the word "practical" is surely Ferrari anathema, the rear hatch has a big opening and the back seats also fold down. Turns out you can take it with you after all. The word "Ferrari" is embossed front and center on the dashboard -- as if you might forget -- in addition to an "FF" logo and the prancing horse emblem on the wheel. Big windows let in lots of light and you can generally see well, even from the back seats, which are set slightly higher than those in front. The front seats are deep, ideal for capturing your frame as G forces pound you into the leather. As for actually sitting in back: Though I had to slouch, my head didn't touch the headliner. About those two optional DVD flat screens in the seat backs: Sorry, but if a $300,000 sports car can't keep you amused, you've been either overindulged or overstimulated. Practicality aside, it's still a Ferrari. The FF hits 100kph in 3.7 seconds with a top speed of more than 322kph. In a single hard blast down a curving section of the Autostrada, my guts turned to jelly. It's fast. There are no obvious drawbacks to the fwd. Hit the gas on tight curves and some torque will transfer to the front wheels. But it always maintains a significant rear-wheel bias. There's little to no understeer. Suspension is firm, but I can't think of another car that feels so supremely confident on all four wheels, and of its rightful place on the road. The same seven-speed, double-clutch, automated transmission found in the 458 Italia is here, too. Technical brilliance. The steering wheel is a bit too light and the kinetic information transmitted about road conditions is scant. If you ignore the shift paddles and leave it in automatic (slacker! ), downshifts come on lazily even when you stomp on the gas to make a sudden pass. But, you know, geez. A Ferrari and the Italian Alps. I circle to the top of a snow-slicked plateau and briefly get a glimpse of the horizon -- icy escarpments sparking in late winter sun -- before dropping down the other side and attacking the winding road. A short time ago I didn't even know this car existed. Now it's all I can think about.